Powers Non-Resonant Resistive and Resonant Capacitive Loads. 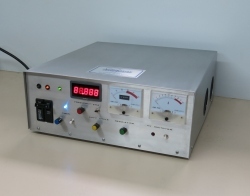 Can provide over 1500 Watts of high frequency plasma energy to a properly matched load. Will provide 600 to 1000 watts to a non complex resistive load such as an arc. Tunable from 20k to 70kHz. With independent voltage, frequency and current control. May be custom made to customers requested specifications. Unit is intended for the experimenter/researcher working in plasma research physics or other similar fields. A certain amount of knowledge helps to effectively operate the unit as in some cases it must be tuned to the output capacitance and resistance of the load. This is basic boilerplate technology to any electronics engineer and may involve simple impedance matching algebraic formulas. These units may be built to individual customer requirements. The basic unit as described can be modified within limits. Please contact our tech team to discuss any modifications or options you may need for your project. Voltage control: ~5kV to 50kV pk-pk output. An analog meter shows DC voltage of the power amplifier. Current control: ~10% to 100% output (duty cycle provides adjustable chopped current pulses at a constant voltage). An analog meter shows current to the power amplifier and indicates resonant rises. Frequency control: ~20kHz to 70kHz. A digital meter displays the operating frequency. Adjustable over-voltage shutdown for those high Q resonant loads that generate high peak voltage powers at resonance. Maximum voltage will depend on your load parameters. The oil-filled transformer is overbuilt to handle high resonant voltage rises, and includes built-in protection circuitry that will shut the system down should the voltage exceed the transformer's insulated rating. The standard transformer tunes out 10 to 200pfd capacitance, but we can build transformers to other capacitive loads; please contact us and specify your requirements. Dimensions: power supply = 16x12x6", VARIAC = 10x10x10", transformer = 16x8x5"
Optional variable 50kV load TEST capacitor and air cooled resistor is available for testing. See downloadable data, and contact us for details. Capable of providing power output up to 2000 watts, with frequency control between 20-70kHz (or customizable ranges). Voltage output is stabilized and power is adjusted by duty cycle control of the amperage. Explanations are given in the video, with examples of use. Click the button below to add the 1-50kV pk-pk, 20-100kHz, 10-2000W Adjustable Power Supply to your wish list.